Thanks to blog readers Kathy, Roy and Joe for their donations. It's the last week of the year, please feel free to show your appreciation for the 2018 season of the blog with a donation via the Paypal button. Thanks. December has been totally epic for the wind related sports, here's a happy windsurfer at Hookipa yesterday in this photo by Jimmie Hepp from this gallery. 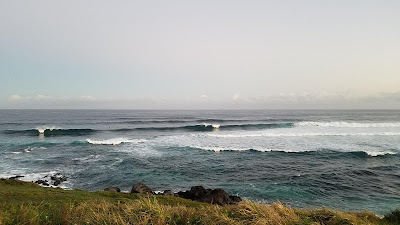 The swell that hit Thursday/Friday was pretty west but big/long period enough to allow it to wrap into Honolua Bay. This is my friend Marco. Not sure what day though. Once again the local buoys show a sliver of long period energy from the SSW and once again all you can see at Ala Moana is the short period one from the SSE. It shouldn't be flat either on the south facing shores of Maui, but not by much. Not a single reading from the NW quadrant at any buoys on December 31st, that's a sign that this has been a bit of an unusual winter so far. Waimea shows a bit of 9s energy from the N, but as Mokapu shows, that's just the easterly windswell wrapping into Oahu's north shore. So windswell only of offer today. Actually, let me correct myself: windswell and wind. North Pacific has the same WNW and NW fetches we saw yesterday, but the first one got a lot closer. When a fetch moves in the direction of the waves it's generating, it's called captured and it's one of the conditions for extra large waves. Unfortunately this one remains from a direction that will be partially blocked for us. Surfline predicts 8.7f 15s from 307 on Thursday. Nothing of relevance from the South. Thanks to blog readers Kristofer, Suzanne and Michael for their donations. Another way to support the blog is to buy advertising space. That's what blog reader (and long time friend) Michelle did, as she just entered the real estate arena. You'll find her banner on the right. Getting a bit crowded there, I will have to raise my prices a bit, but I'm going to do that only in a week. In the meantime, the prices are: $50/month or $125/three months. After that it'll be $75/month or $200/three months. You will be grandfathered the old prices if you buy an ad space before January 6th and renew it continuously. Unfortunately all this asking for support happens while I'm injured, so the blog content is not as rich as usual (and the call doesn't get posted as early), but I hope it's going to go back to normal soon. 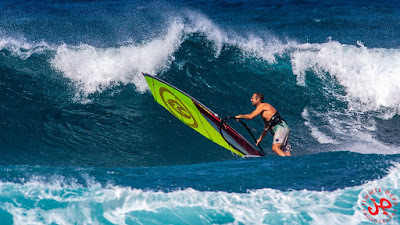 Jimmie Hepp was at Hookipa shooting the windsurfers and here's a shot from this gallery that shows the still remarkable size of the waves. Lovely slivers of long period energy at the local buoys, I went to look for the possible SSW fetch on the maps from a week ago, but couldn't find anything at all, so I don't think that will increase in a noticeable way. In lack of a local lahaina webcam (please check the Ozolio website if you can host one), the picture of Ala Moana below only shows the 8s waves instead. 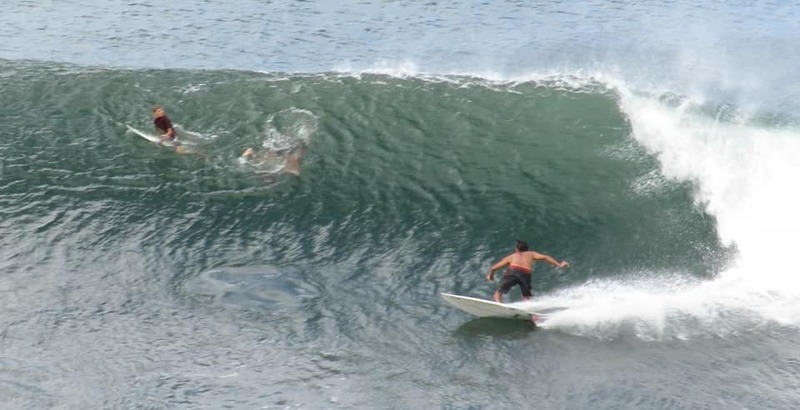 Better than nothing, that'll make the tons of beginner visitors (and the surf schools) happy. The fact that the NW energy disappeared already at the NW buoy tells us that it won't last long also locally. Still a fun 5f 13s at the moment, but declining all day. In addition to that Pauwela offers 6.3f 9s from 34 degrees (really not sure this is a correct direction, but it's a somewhat northerly windswell). Mix of swells are usually not the best, but what counts is the wind, which is going to be strong easterly again. North Pacific shows that the complex gyre off the coast of eastern Asia is now split in multiple lows. The stronger fetch is the WNW one right in front of Japan, but that'll be pretty sheltered by the upstream islands. The smaller NW fetch will have less trouble sending us energy, but it's smaller/weaker at the moment. 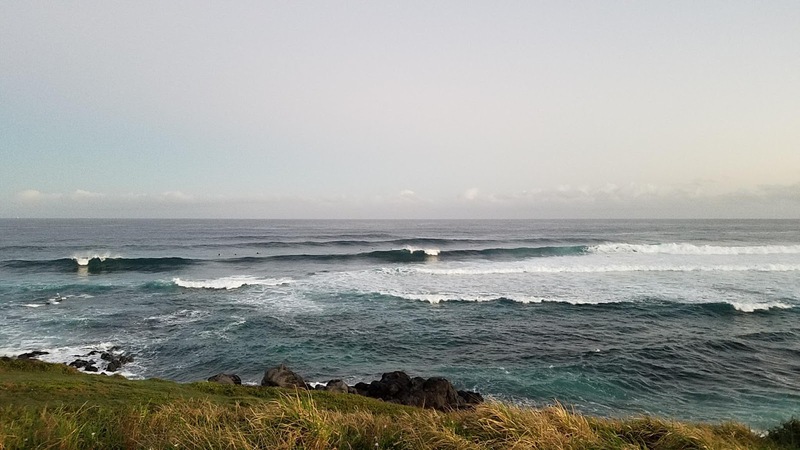 Overall, it's been a period with no shortage of waves on the north shore, but not ideal for the west side which prefers a more northerly direction. Tiny little S fetch back South. Thanks to blog reader Shep for his donation. 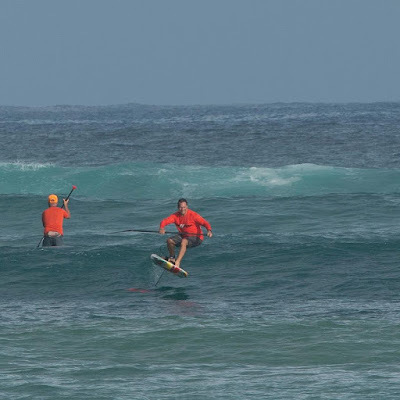 I'm injured and these are the photos I took in the morning at Hookipa. Seen the westerly direction of the rising long period swell, The Point was the worse of the four main breaks (strong rip going across), but Jacob Romero managed to find an Honolua looking one. The real beauty was across the channel though. Young Abby isn't scared by big waves and was charging Middles. Meanwhile Kai Lenny and friends were deciding were to go. They drove up the coast (probably to check Jaws), but came back (probably too windy). Albee Layer was out on a strapped surfboard. He was doing pretty good at getting in the straps (front foot in right away and back foot as soon as he had an opportunity), generating the speed (he was going definitely faster than normal), doing the rotation, but he was missing most of the landings. From my point of view, he's just not used to them and should insist. To me, they make so much sense for aerials. 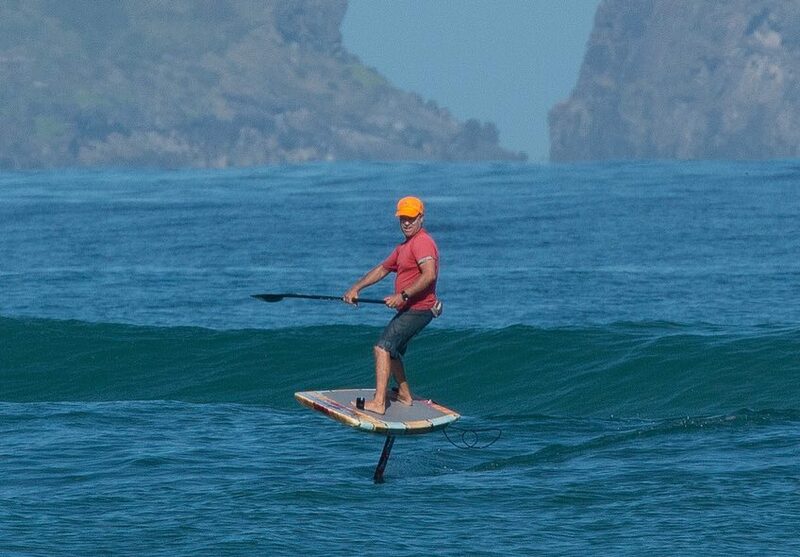 They make so much sense also for regular surfing, that I might put them back on one of my surfboards too (did that long time ago). He then went for the small straight air below and finally landed it. The massive celebration was obviously self-ironic. Tanner Hendrickson was out there too, placing powerful turns through the ribs created by the rip current. I'll add this photo to yesterday's post and add it to the "foiling" label. No indication of southerly energy at the buoys. Yeterday a Hi-Tech rental customer gave me a report of knee high waves at Launiupoko, but I highly doubt there will anything at all with Ala Moana looking like this. 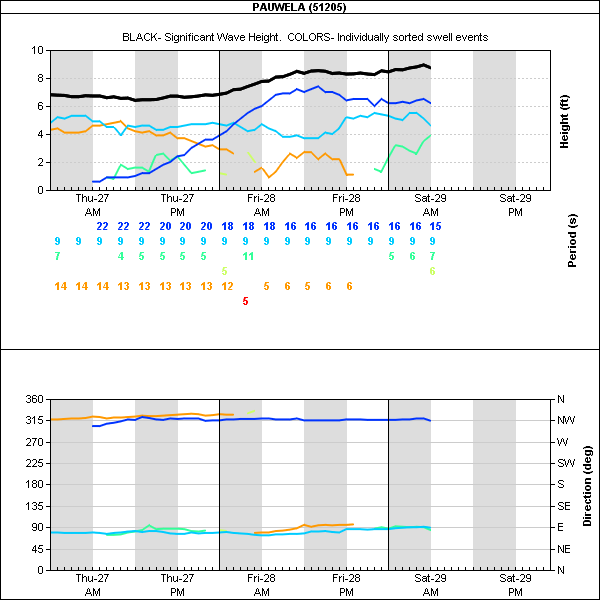 Below is Pauwela's graph that shows that the swell peaked mid day yesterday. 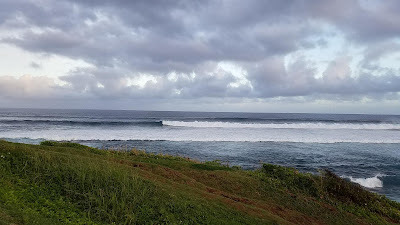 Still plenty energy in the water though, the problem (for the surfers) is going to be the wind that is predicted to return whipping Maui's north shore from an easterly direction. North Pacific still has a strong and wide WNW fetch, with the same N and E small much closer fetches we saw yesterday. Hanalei's reading 6.6ft @ 9s from 347° (NNW) is probably because of the N one and we should expect that energy to start rising in Maui too. Tiny almost insignificant S fetch in the South Pacific. 8, if you get a small one without getting caught inside. But 6 overall. 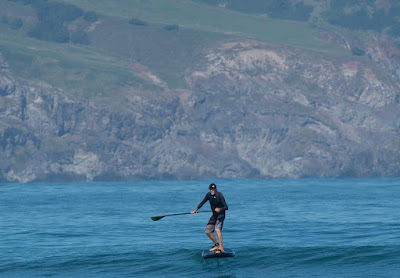 Yesterday morning my ribs weren't too painful and the waves were gorgeous, so I couldn't resist the call and had a shortboard and a SUP foiling session. That was a bad idea, as this morning the ribs are significantly worse than they were yesterday. GP, you're injured and you got to stay put, no matter how good the waves are. 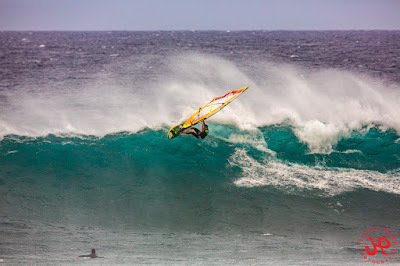 This over exposed shot of Ian Walsh is all I have to document the surfing conditions at Hookipa yesterday morning. Actually, what am I talking about, I got plenty gopro material. First wave of the day was good one. That's a heavy lip trying to take me out. No wonder I look happy I escaped it. Hawaiian snow. 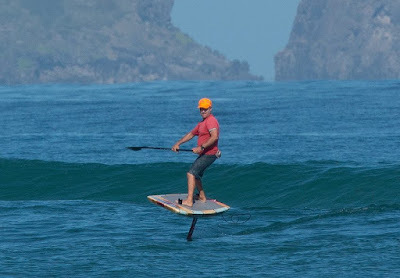 Afterwards I taught a SUP foiling lesson and after that I had a lovely session myself. On this wave I try to talk over for teaching purposes, since you can't see anything of what I'm doing. New large long period NW swell on the rise. 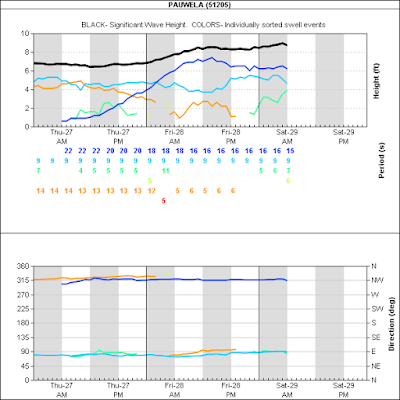 Below are the graphs of the reported buoys plus the Surfline forecast. They all have a different scale, so I reported the upper end of it in red. Notice how accurate the Surfline forecast is in this case, as it was reporting 5f 18s in the early morning, which is exactly what we have at Pauwela. That also means that the swell is going to keep building all day. The forecast calls for 8.5f 16s at sunset. Let's also not forget the ENE windswell that will hit the easterly exposures. Wind map at noon. Notice the onshores on Oahu that should coincide with the arrival of a front. Here's the Big Blue satellite shot that shows the front. 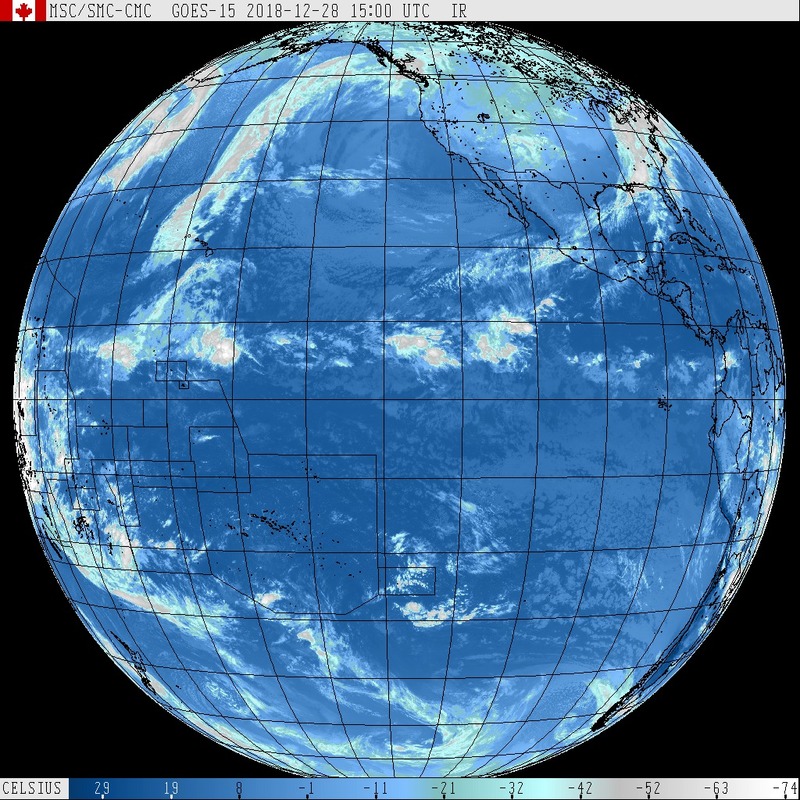 North Pacific has a wide WNW fetch and a weak NNW and E windswell ones. The section of the first one that is more west than 300 will get mostly blocked by the upstream islands. Nonetheless, Surfline has this swell at 9f 16s on Wednesday and 10f 15s on Thursday. South Pacific has a small/weak S fetch. Morning sky shows the big clouds over to the west. 7am hookipa is head and a half to double and light offshore. Bit wobbly with the high tide and windswell travelling across, but still an 8.5. A SUP foiling session for me yesterday, conditions were too good to pass and the ribs didn't hurt as much while paddling standing up. 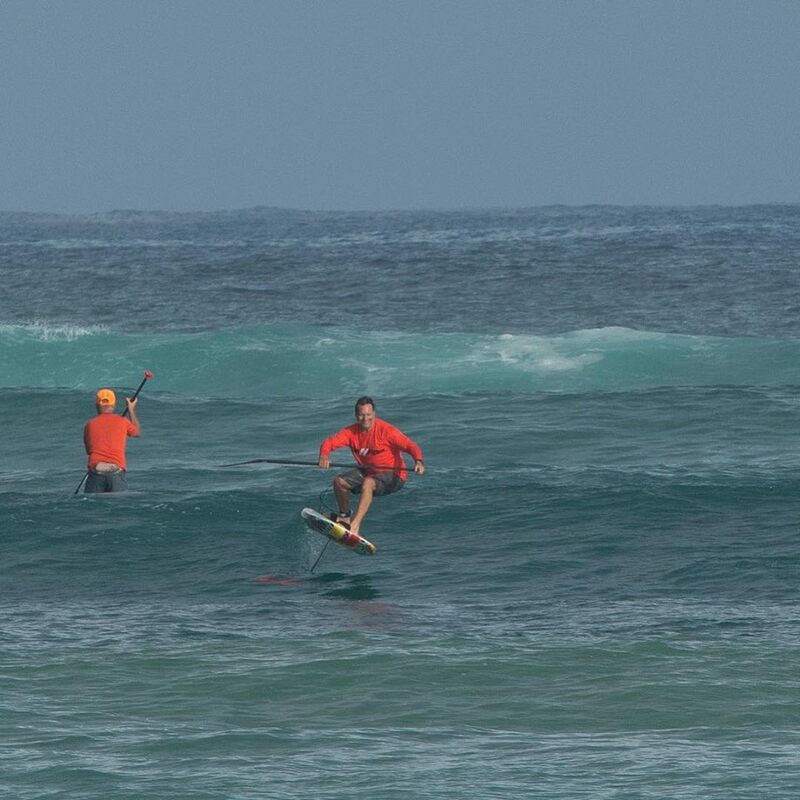 Seen the excellent conditions, it was a bit hard not to paddle out at Hookipa in the morning though, as the photos I took in a 20 minutes photoshoot show below. This are the photos by Chris of the morning foiling session down the coast (I went late afternoon and it was pretty much just as good). Been tripping out on this shot as I didn't remember a spot in the background with a separated rock, before I realized that there's a wave out the back that probably covers the continuous coast line. Still don't remember I spot like that, I'll have to look for it today. No indication of southerly energy at the buoys. FYI, that strong E windswell is also at all the other buoys. I didn't report it because it's not relevant for us. Knowing that Hanalei has 4.5ft @ 10s from 46° (NE), doesn't add any information since we already have that energy reported at Pauwela. That's why I call this section (the most important of the morning call) "significant buoy readings". That'll give some nice waves to the east facing shores like Waiehu (shoulder high yesterday). At the same time, the NW energy is still at a very fun size of 4f 14s and, as you can see from the long period low reading at the distant buoys, a new swell might start to be noticeable towards sunset time. I wouldn't wait for it though, as the big day really is tomorrow. Surfline has 5f 18s in the early morning, rising and peaking at 9f 15s Friday night. That is the swell out the captured fetch we observed over the past few days. I'll try to report before 7am, but I'm not sure I'll be able to. Wind map at noon. These days when the offshore direction of the wind has a little bit of south are the ones in which the model can easily be wrong and predict the wind line to hug at least the Hookipa coast, while it might not happen at all (like yesterday). Still good to know what the model thinks. Should be another glassy or even light offshore day all morning anyway. North Pacific has a moderate NW fetch and new born WNW just off Japan and the offshore windswell one. Couple of very weak fetches from the South.